INDIANAPOLIS - The Tribe's Opening Day outfield is all but set as Jason Martin and Bryan Reynolds are expected to man two of the three spots on a regular basis. A handful of players are still competing in Bradenton for the last remaining Triple-A starting spot, bench roles and outfield depth for Pittsburgh as potential in-season call-ups. In preparation for the season, we look ahead at those who may be roaming Victory Field's grass in 2019. 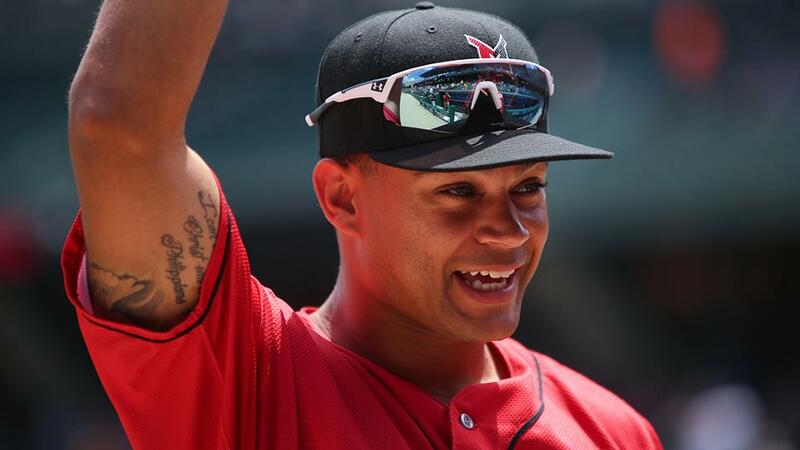 Jason Martin - Martin started 51 games in center field for the Tribe in 2018 and enters the 2019 season as Baseball America's No. 10 Pirates prospect. During 59 total games (57 starts) in the Triple-A outfield, he topped off a perfect fielding percentage with one assist. His defense was also stellar at Double-A Altoona, where he committed only one error in center field over 532.0 innings. His 2018 resume includes a combined .274 batting average (128-for-468) with 13 home runs and 55 RBI between both levels. Bryan Reynolds - Drafted in the second round in 2016 by San Francisco, Reynolds is projected to start in either corner outfield spot for the Indians on April 4 after joining the organization via the Andrew McCutchen trade in early 2018. He opens the year as Pittsburgh's No. 9 Baseball America prospect after committing only two errors between center and left field in 730.1 innings for the 2018 Curve. His appearance at the plate wasn't too shabby either, despite missing 42 games with a broken left hamate bone, as he hit .302 (100-for-331) with 28 extra-base hits and 46 RBI in his first year in the Pirates organization. Jerrick Suiter - With Martin likely manning center field and Reynolds pegged for left, Suiter is the perfect complement to fill out the outfield for Opening Day. As a corner outfielder, he saw time in right field for 224.0 innings in 2018 (almost 100 innings more than left field) and only committed one error at both positions. Suiter also tallied eight assists, including six baserunners thrown out at home plate. Pablo Reyes - Reyes ended 2018 in Pittsburgh and could pick up where he left off to begin the 2019 season. For the Tribe he appeared in 110 games, splitting time between the infield and outfield. In 451.2 Triple-A outfield innings he committed only one error, and he carried that success to the plate. He hit .289 (103-for-356) in Indy and made the most of his September promotion to Pittsburgh, hitting .293 (17-for-58) in his final 18 games. Jose Osuna - Osuna could also split time between Indy and Pittsburgh after his successful 2018 campaign. With the Tribe last year, Osuna hit .321 (97-for-302) with a team-high 59 RBI and only 51 strikeouts. He primarily saw time in the infield but held a perfect fielding percentage between 122.0 combined Triple-A and major league outfield innings. He was named Indy's 2018 Silver Slugger Award winner at the end of the season. Logan Hill - As a corner outfielder, Hill appeared in 92 games for Altoona in 2018 with three errors, but his bat is what could make the difference. Last season, he hit 17 home runs and collected 72 RBI. By performing well, he could see time in Indianapolis during the 2019 season. Melky Cabrera - Cabrera has started in the outfield for over 1,600 major league games, making him by far the most experienced at any position on Indy's potential roster. He holds a .989 career fielding percentage over 14 seasons in the big leagues. His success at the plate has also held strong, including a .321 average (25-for-78) with Triple-A Columbus in 2018. JB Shuck - Through 314 major league games, Shuck has registered six total errors in the outfield. He's as versatile as they come, splitting time almost evenly between the three positions. In 2018 with Triple-A New Orleans, he hit .327 (54-for-165) and registered a career-best .866 OPS. Patrick Kivlehan - With three major league seasons under his belt, Kivlehan has experience to lead as well as compete for a potential call-up. In 471.1 combined innings between Arizona, Triple-A Louisville and Triple-A Las Vegas, he committed only one error. He spent the majority of the 2018 season in Las Vegas, where he hit .314 (111-for-354) with 20 home runs, 29 doubles and 67 RBI through 98 games.